LeafFilter Reviews - Ideal Gutter Protection? Using a patented micromesh design that doesn’t require you to purchase new gutters, the LeafFilter gutter guards claim to prevent pesky (and potentially dangerous) cleaning each year. In business since 2005 and headquartered out of Hudson, Ohio, LeafFilter’s premium systems attach to your existing gutters and are guaranteed to permanently keep everything out except water. 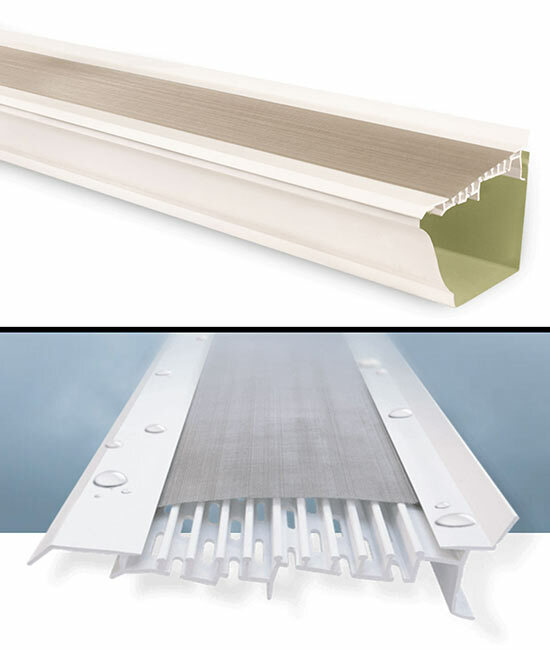 How can you choose between LeafFilter and the dozens of other popular gutter guards? In this article, we’ll walk you through the pricing, online customer feedback, and the competition—starting with their basic functionality. Jim Gorman of This Old House magazine reports that just one inch of rain can represent up to 1,900 gallons of water falling on your roof. And if you don’t have gutters diverting it to specific areas, this water can eventually lead to all kinds of problems, including a buildup of pressure that causes cracking and sinking in the foundation (depending on soil type), rotting in the siding, and can even penetrate window casings and enter your home’s interior. Despite their importance, most of us have the habit of letting our gutters fill with leaves, pine needles, and other debris to a point where their effectiveness is at least somewhat impacted. After all, it’s a thankless, labor-intensive, and sometimes dangerous process that no one looks forward to. 1. Micromesh Filter – On top is a micromesh filter made out of a surgical grade stainless steel, which will never rust, corrode, or allow anything to adhere to it. To effectively handle as much water as traditional open-faced gutters, while still shedding debris, LeafFilter’s product is installed at a specific 11° pitch. 2. uPVC Frame – The filter is affixed to a durable uPVC frame, which we’re told can handle the most extreme temperatures, whether heat or cold, and will never warp or deteriorate. 3. Reinforcing Hangers – As your LeafFilters are installed, internal hidden structural hangers are fastened into your fascia board, which prevents your gutters from pulling away from your home. Here, we can see a cutaway of LeafFilter’s three-piece gutter guard system, including the micromesh screen, uPVC frame, and reinforcing hangers. Credit: LeafFilter North, Inc.
Because of its low-profile design, LeafFilter advertises that their system won’t be seen from the ground, and it’s available in a number of colors to match your home’s design and your taste preferences. How Much Does LeafFilter Cost & Where Can You Buy? According to their website, the total cost for a LeafFilter system will depend on a number of key factors, including the size and shape of your existing gutters, their length (as measured in linear feet), and their condition (some might need to be replaced beforehand). If you have some areas around your home with heavy debris, and others with little-to-none, you might only need a partial install as well. With these details in mind, you can receive a free, no-obligation estimate, which is valid for one year. Financing is available for those who qualify, which can be as low as $35 per month with a 0% APR. Seniors and military personnel can also enjoy a 10% discount. All LeafFilter systems come with a money back, no clog guarantee, so “you can enjoy the peace of mind that your gutters are protected for life.” This warranty is also transferable to a new owner if you sell your home. If you have additional questions, a LeafFilter representative can be reached at 800-290-6106. What Can We Learn From LeafFilter Customer Reviews? LeafFilter’s systems had more than 1,500 customer reviews on Trustpilot at the time of our research, with an average rating of four stars. There, most compliments revolved around their effectiveness at keeping out debris, as well as quick and easy professional installation. On the other hand, the relatively few complaints often referenced ineffectiveness (specifically, that rain goes right over them and creates a waterfall effect wherever they’re installed), although many claimed this was due to faulty installation and warranty support provided by third-party installers. We also encountered more than 10 customer reviews on Yelp, who had given LeafFilter a meaningfully lower 2.5-star average rating. Complaints and compliments mostly matched those found on Trustpilot. In other words, LeafFilter is up against some hefty competition, many of which install over existing gutters, use stainless steel micromesh screens (or other patented aspects) to trap debris while maintaining water flow, feature weather and UV-resistant frames, are available in a variety of colors and finishes, come with extensive warranties, install using heavy-duty mounting brackets, and boast attractive/unnoticeable designs. How to choose between these relatively similar options? Like with any other product, the price will certainly play a big factor, so you'll want to obtain several different estimates to ensure that you're not paying too much. And if you’re relatively handy and don’t mind adding some sweat equity, installing a DIY leaf guard could represent the best bang-for-your-buck. Once you’ve narrowed your options down to one or two manufacturers, another good idea is to verify whether or not their gutter guards are installed in-house, or by third-party contractors. If handled by third parties, based on what we learned from online customer reviews, experiences can vary. Sometimes, these contractors are responsible for providing warranty support, which means that if they go out of business, your warranty goes along with them. Along these same lines, returning to the Consumer Reports article cited earlier, they point out that you’ll want to ensure installing an aftermarket leaf guard won’t void your existing roof or gutter warranty. “Although having guards can significantly decrease the maintenance, as you will no longer need to clean the interior of your gutter system, (with the right guards) you will still need to brush off the top of the guards to remove the leaves and debris that will inevitably pile on top of the guard. Let’s pull all of this information together and come to a conclusion about LeafFilter. 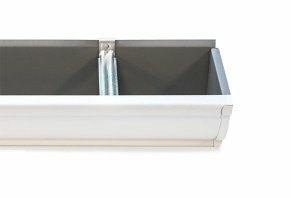 Is LeafFilter the Right Gutter Guard for You? The bottom line is that we didn’t perform firsthand testing on any leaf guard systems during our research. But, whether it comes to LeafFilter or another micromesh-based gutter guard, we think your first decision shouldn’t necessarily revolve around effectiveness, but overall value. For example, writing for Angie’s List, Cynthia Wilson explains that in general, gutter guards cost between $7.50 and $10 per linear foot installed. "Considering that the average home has about 200 feet of gutter," she says, "homeowners should expect to pay about $1,500 and $2,000 for professional gutter guard installation, though more complex gutter guard systems will be more expensive." Comparatively, HomeAdvisor reports that the national average cost for professional gutter cleaning is about $151. This means that if you had yours cleaned once per year, it could take you between 10 and 13 years to make up the price of a gutter guard installation. With these details in mind, LeafFilter has been in business since 2005 and held an A+ Better Business Bureau rating, with on just one closed complaint, as of 7/24/18. Based on the sheer number of feedback on Trustpilot, the overwhelming majority of customers also seem pleased with their gutter guards. And other than the Gutter Topper liquid adhesion model, they’re the only micromesh-based option that offers a lifetime transferable warranty, if this is one of your main criteria. Write a Review for LeafFilter!